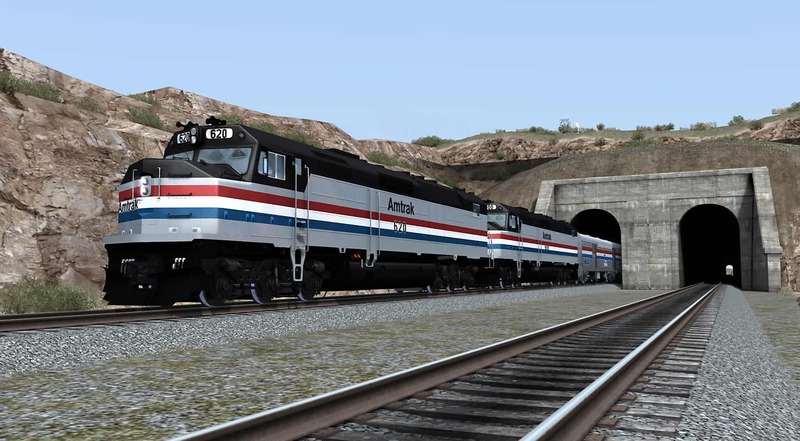 The new Amtrak SDP40F pack includes the memorable diesel in three liveries – and extraordinary Amtrak passenger equipment! 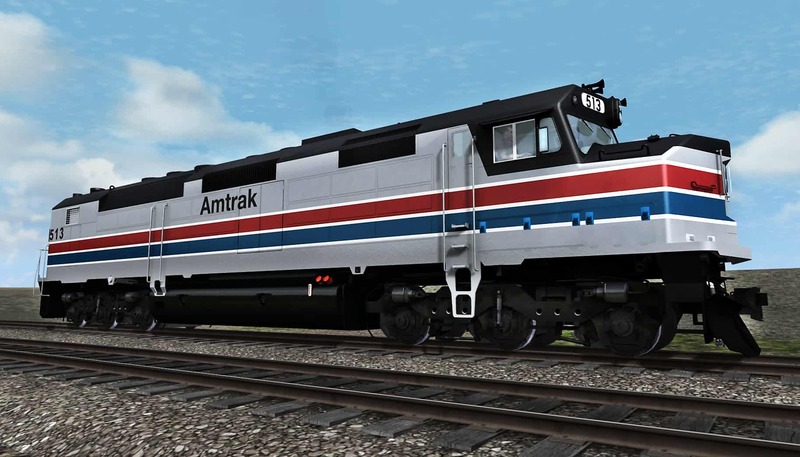 Amtrak’s Electro-Motive SDP40F, a memorable and historic American locomotive, is now available for Train Simulator in three authentic liveries – and with it comes an extraordinary complete set of Amtrak’s classic ex-Santa Fe Hi-Level passenger cars! In a previous article here at Dovetail Live entitled “Memorable, but Star-Crossed”, we explored the remarkable history of the Amtrak Electro-Motive SDP40F. And now, thanks to the craftsmanship of DTM, the big diesel is ready for Train Simulator service. From its debut in June 1973 until its premature retirement in the early-1980s, the husky, 3,000-horsepower Amtrak EMD SDP40F served the national passenger railroad literally from coast-to-coast. Amtrak operated 150 of the 400,000-pound, six-axle “cowl” diesels, and the SDP40Fs could be found on the point of numerous notable Amtrak trains including the Broadway Limited, Silver Star, City of New Orleans, Southwest Limited, San Francisco Zephyr, and Empire Builder. During the 1970s, whether you were in Washington, D.C. or Miami, Chicago or New Orleans, San Diego or Seattle, chances are you would encounter a big Amtrak SDP40F at work. 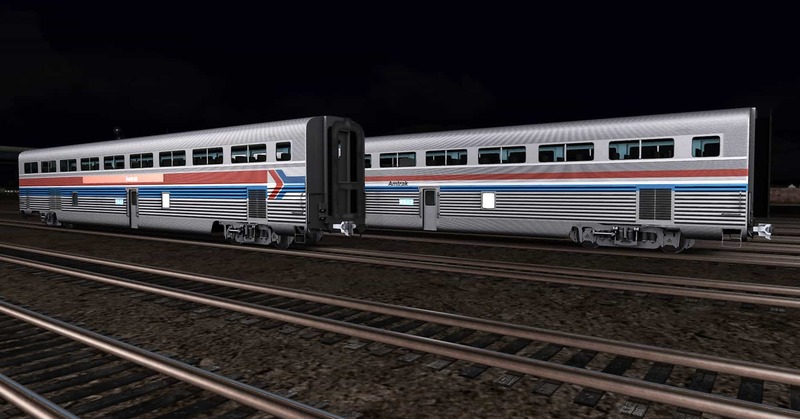 Thus, the new SDP40F, provided in Amtrak Phase I, II, and III liveries, will be a perfect and authentic fit on a wide range of Train Simulator U. S. routes! 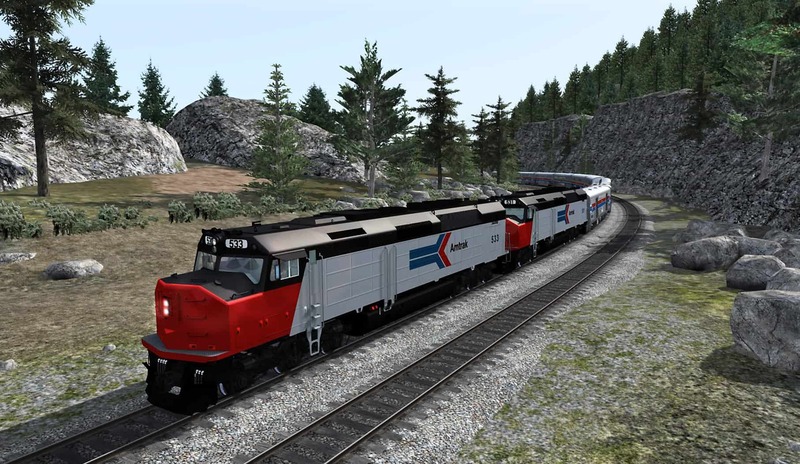 To say the least, Steam Workshop creators will be busy putting the now-available SDP40F to work, and the pack also features four ready-to-go career scenarios on Train Simulator’s popular Donner Pass Southern Pacific route. 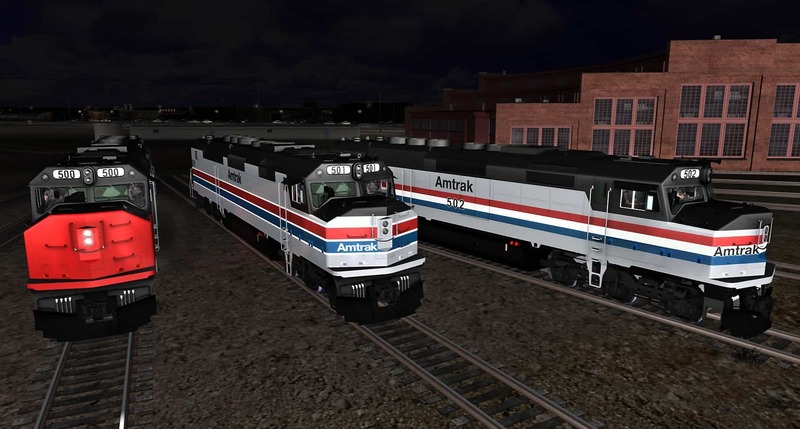 Joining the Amtrak EMD SDP40F in this new pack from DTM is a complete set of Amtrak’s distinctive Hi-Level passenger cars that begin life as equipment for the 1956 edition of Santa Fe’s Chicago-Los Angeles El Capitan, the coach sister of the fabled Super Chief. 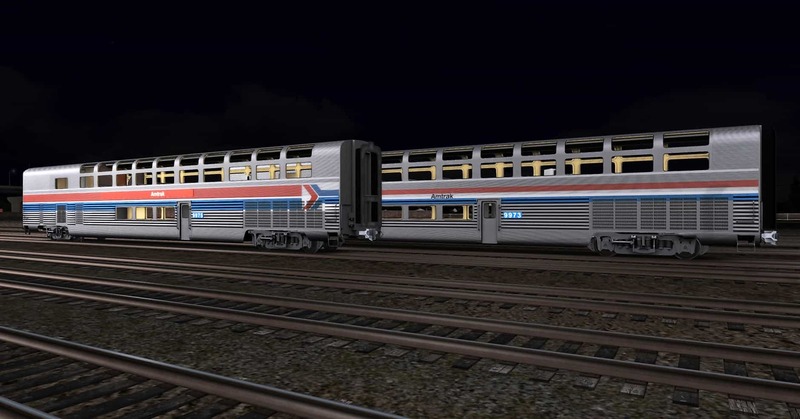 After the creation of Amtrak in 1971, the ex-Santa Fe Hi-Level cars went on to lengthy careers serving Amtrak and, indeed, the design of the Hi-Levels provided the inspiration for today’s popular Amtrak Superliners. DTM’s new SDP40F pack includes six passenger-car types: A single-level, Santa Fe-design baggage-express car; unique baggage-dorm-transition car; standard and “step down” Hi-Level coaches; Hi-Level Lounge; and Hi-Level Diner. And the cars are provided in both Amtrak Phase I and Phase III passenger car liveries. 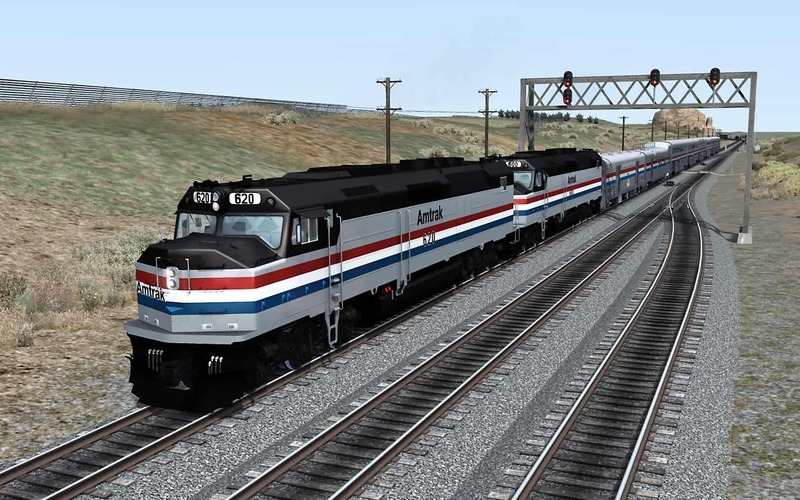 The memorable Electro-Motive Amtrak SDP40F (above), and a complete set of distinctive ex-Santa Fe Hi-Level passenger cars (below), is now available for Train Simulator through the superb craftsmanship of DTM! Screenshots by Gary Dolzall. Dressed in original red-nosed Phase I livery, a duo of Amtrak SDP40Fs are challenging Southern Pacific’s famed Donner Pass (above). Amtrak acquired 150 of the SDP40Fs in 1973-74 with the intent that the husky EMDs would be the passenger carrier’s nationwide diesel motive power. Amtrak SDP40F 513 (below) wears the carrier’s Phase II livery which debuted in 1974. Dressed in Amtrak’s Phase III livery introduced in late 1976, a pair of SDP40Fs are rolling west on the Sherman Hill route (above and below). 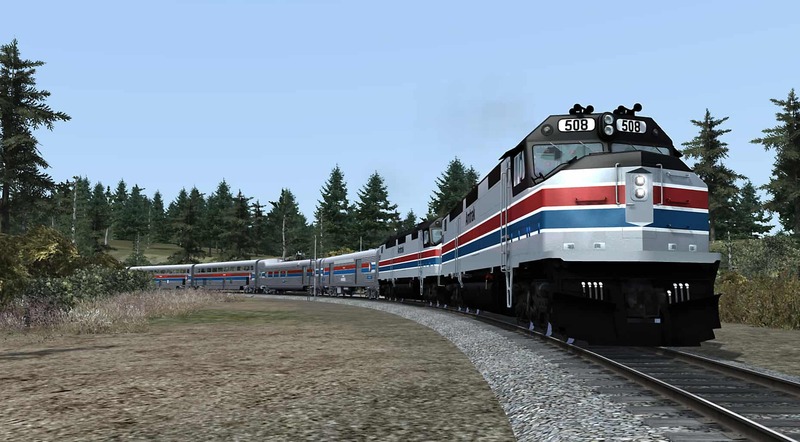 Amtrak’s fleet of SDP40Fs served from coast-to-coast in the 1970s and accordingly the SDP40F will be a perfect and highly authentic fit on numerous U. S. Train Simulator routes! 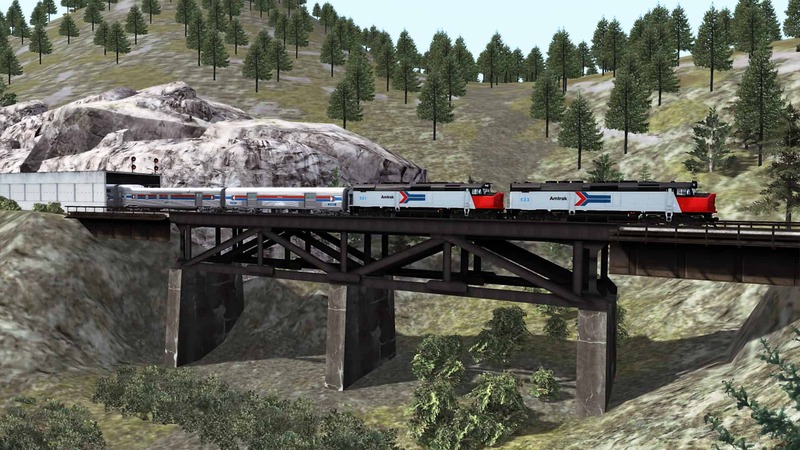 Putting their collection 6,000 horsepower and 12 powered axles to work, a duo of Amtrak SDP40Fs in original livery tackle famed Donner Pass (above and below). 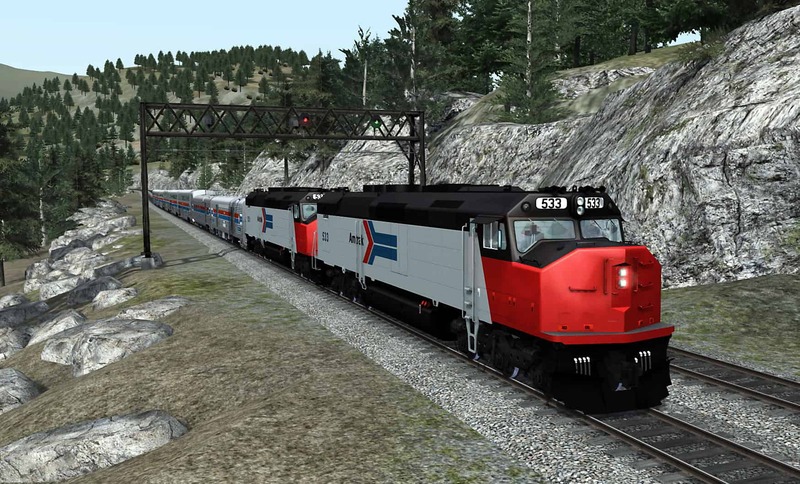 The new SDP40F pack includes four career scenarios on the Donner Pass Southern Pacific route and is QD (Quick Drive) enabled. Accompanying the SDP40F is a complete set of Amtrak’s ex-Santa Fe Hi-Level equipment, including the magnificent “Sky Lounge” (above) and Hi-Level coaches (below). 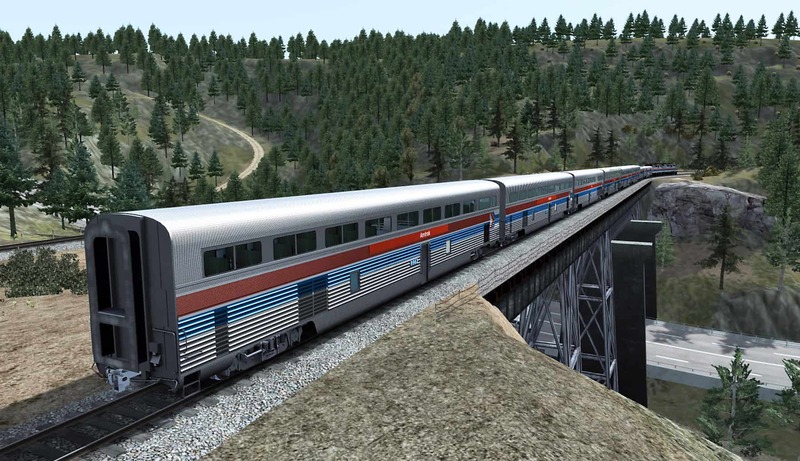 Also included are a standard Santa Fe-style baggage/express car; unique baggage-dorm transition car; and Hi-level Diner – and all six car types are provided in Amtrak Phase I and Phase III passenger car liveries. 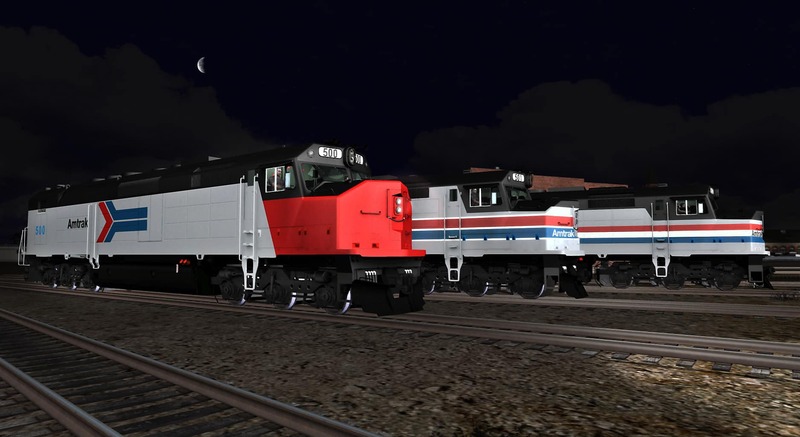 Now available at the Steam and Dovetail Games stores, the Amtrak SDP40F pack from partner programme member DTM includes the memorable EMD diesel in three authentic liveries – and delivers diverse and challenging Train Simulator passenger railroading action!